Freshman Ellie Duhig competing in a home game against Kentucky Country Day. 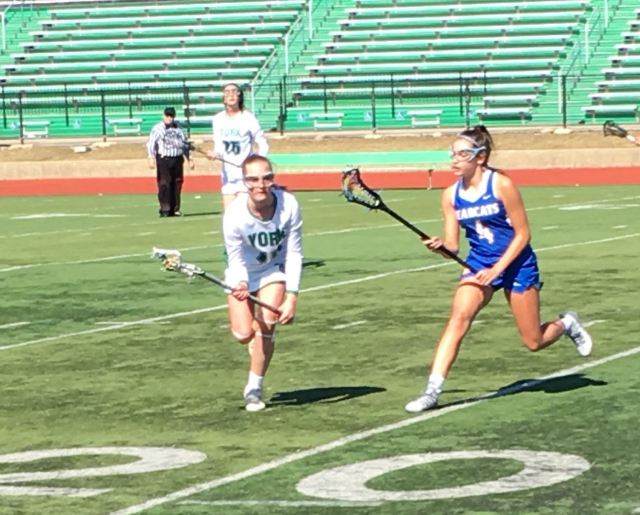 It’s spring time– the weather is getting warmer, the end of the school year is in sight, and the girls varsity lacrosse season is in full swing. The team has been working hard since pre-season in January at the early morning before-school practices. They are now reaching the midpoint of their season with a recent streak of 3 wins, some of which were played in their tournaments located in St. Louis this past weekend. Their overall record is currently holding at seven wins, three losses. Despite these losses, the team is working to fuel competition and learn from their mistakes. The team has proved that their work in practice is paying off in games similar to the team’s tournament in St. Louis. A great opportunity for getting some competition, the dukes dominated the field– their first game winning 19-10, their second 18-4. With team opportunities like the time spent in St. Louis, the team has been able to become closer on and off the field. In order for the team to maintain cohesion and a close bond, many girls look to each other for motivation. There are multiple athletes that have been stepping up and becoming leaders this season. Not only have seniors served as leaders for the team, there are multiple underclassmen who have shown impressive skill for being on the varsity level. Looking forward to the rest of the season, the team seems to have high expectations and clear goals to work towards. “For this rest of our season, the goals are to win the rest of the games and goes as far into the playoffs as possible,” Kraus said. As this dedicated group has just one month left of their season, they plan to finish strong and maintain a hard work ethic and positive attitude to achieve these goals.